Come and join us for music and fun on Friday, March 16. 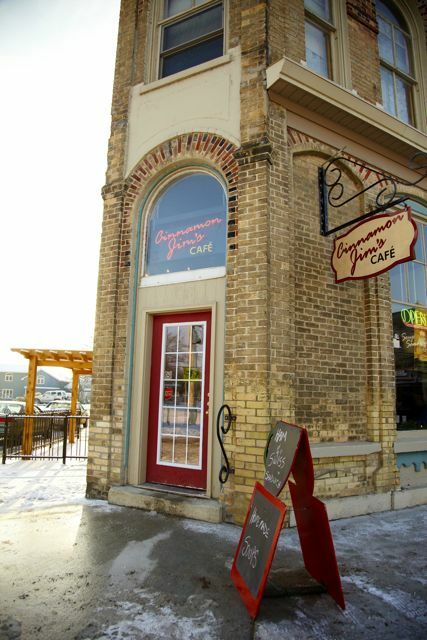 We’re serving fresh Huron County leg of Lamb at $14.95 pp or hot beef sandwich at $10.95 pp with music in the café by James Mintz, who will be playing a selection of folk, country & blues. What a voice! Dinner from 5:00 to 8:00 pm, music from 6:00 to 8:00 pm. Reservations recommended. On Saturday, March 17th Don and Dale will be treating us to some traditional Irish music from 11:30 am to 2:00 pm. Corned Beef & Cabbage at $ 10.95 pp & traditional Irish stew at $6.50 pp. 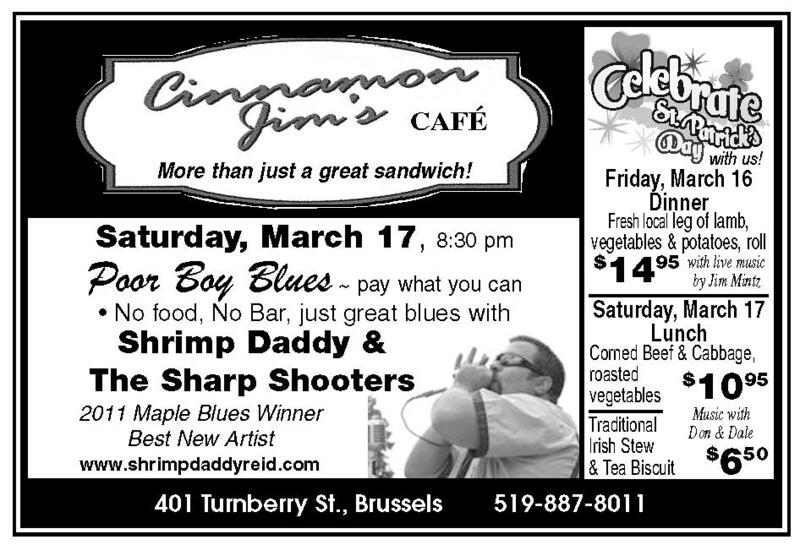 At 3:30 we’ll be shutting down to have a little Irish rest before re-opening at 8:00 pm in the Upper Deck where we’ll be featuring Poor Boy Blues, with Maple Blues Award Winner Mike Reid. His band is Shrimp Daddy & the Sharp Shooters. There is no cover charge, just pay what you can. This is going to be a great show. Mike is a real down to earth player, who cut his teeth in Montreal and is looking forward to a warm Brussels welcome. Check him out www.shrimpdaddyreid.com We will not be serving food, nor have a bar. This will be considered a private party and your donation will help cover costs. No reservations required. Cheapest prices Pharmacy. Dapoxetine Buy Us . Top Offering, buy dapoxetine online. This entry was posted in Uncategorized on February 29, 2012 by Jan Hawley. The Gateway Researchers in the Town of Seaforth are looking for 10 more participants, preferably single people between the ages of 45 & 65, who are still in the workforce. The interview will focus on your knowledge of health issues and government support for seniors etc. The whole process takes about one hour. It’s as simple as that! As a bonus, you will receive a $25.00 gift card from Foodland for your efforts. So for those who are interested here is the email address of the pharmacy student who is undertaking the research…..please contact Nishi Gupta at nsgupta@uwaterloo.ca if you are interested in this worthwhile research project. Online Canadian Pharmacy Store! Cost Of Zoloft At Cvs . Fastest Shipping, generic zoloft Is No The Same. This entry was posted in Uncategorized on February 26, 2012 by Jan Hawley. Preserve, Conserve & Protect…..find out how! 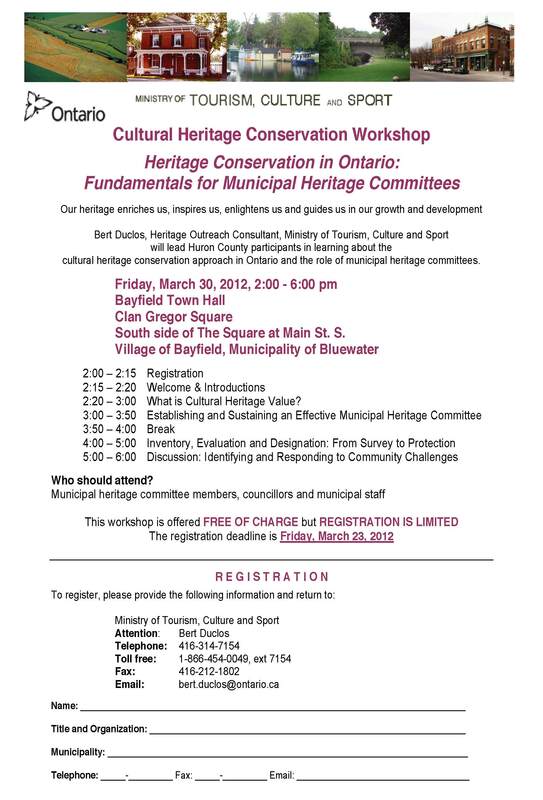 Sign-up for this workshop sponsored by the Ministry of Tourism, Culture and Sport & the Municipality of Bluewater Heritage Committee. Learn from the experts – Space Limited – Register NOW! This entry was posted in Uncategorized on February 19, 2012 by Jan Hawley.